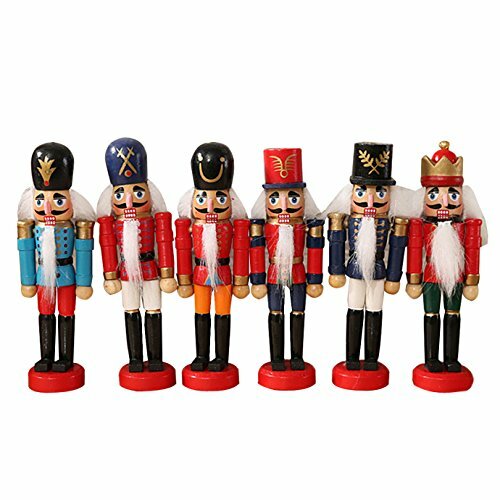 This is a cute wooden nutcracker soldier figures ornament toy. Glitter and vintage design, will be the best christmas decorate. It can add festive holiday cheer to your home and complement any Christmas decor theme. Nutcracker are gorgeous table ornaments, can decorate your home, room, table, party, wall etc. Creative and delicate workmanship, great gift for your family, friends, kids etc. Made of good quality wooden material, delicate workmanship, lightweight, wear resistant. Toy size: 12cm * 4.7in, perfect on tables, computer table, shelves, counter tops, and more. Cute and bright color design, round base, can be steady stand on the table as decorations. Gorgeous table ornaments. This nutcracker will complement any Christmas decor theme and is sure to bring the Christmas spirit into your home. Exclusive design nutcracker ornament for collection. Perfect Christmas gifts for your family, friends and kids.